What’s the average costs for a Professional DJ? Wedding costs are a major concern for most, as well they should be. How much to spend for food, gown and tux’s, location, photographer and, of course, entertainment. All of these expenses can be reduced, but which ones should be and why? Here is where we start to get into factors that make some DJs/KJs different from each other. Mostly, this should all be transparent to you, the client. How extensive a DJs library of music is, or what kind of equipment they carry is unimportant as long as you and your guests are happy with the tunes, and the way they sound. The point here, though, is that in order to keep all this transparent to you and your guests, a mobile entertainer has to spend money…and a fair amount of it! Quality equipment (and I’m not talking about the stereo equipment in your average consumer electronics store) costs plenty, and we all know how much a compact disc runs these days. If a mobile entertainer can afford to charge less than the average, then ask yourself…where are they cutting expenses so they can cut costs?? 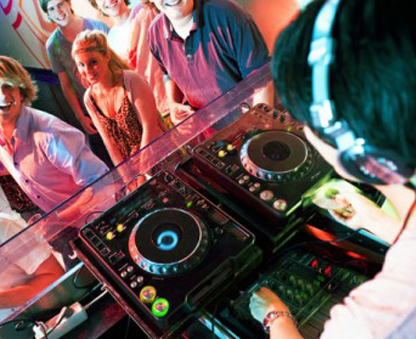 Disc Jockey Rates vary based upon talent, experience, emcee ability, service, coordination, equipment needed, music knowledge, mixing ability, and personality. A full-service DJ company will normally invest 12 to 30 hours to your special affair, but you may appear that you are only paying for “4 hours”. Consultations, music purchases, editing, preparation, set-up and tear-down of equipment, education and other business related endeavors all add up to endure the overall success of your special occasion. Rates for professional disc jockeys will average $750 to $1500 for a 3-6 hour affair. What should I expect from Professional DJ? Most mobile entertainers are professionals who take pride in our companies and our reputations. Our clients, our customers are important to us. Your event becomes a reflection upon us. We care about how it goes, and we care that you and your guests remember how good a time they had, rather than how good the veggie platter was! Most mobile entertainment companies will fall into a set of price ranges, based on what market they operate within. Regardless, after shopping around, you should be able to get a feel for what price range and what level of service you should be looking for. Once you’ve narrowed down what you want, your final decision, your choice of entertainment, however, should not be based on price, but on quality. Even more important is your comfort level with the company. No amount of high-tech gear is going to make up for a clash in personalities. Sometimes people just don’t click! And you don’t want someone you think is perfectly obnoxious entertaining you at your birthday party, do you?! Because you are trusting the success of the event to this person, isn’t it important that you feel comfortable with that person?